Going to Greece in September of 2008 was actually our first trip overseas. Two of my adult children were living in Europe–one in southern France and one in Madrid, Spain. 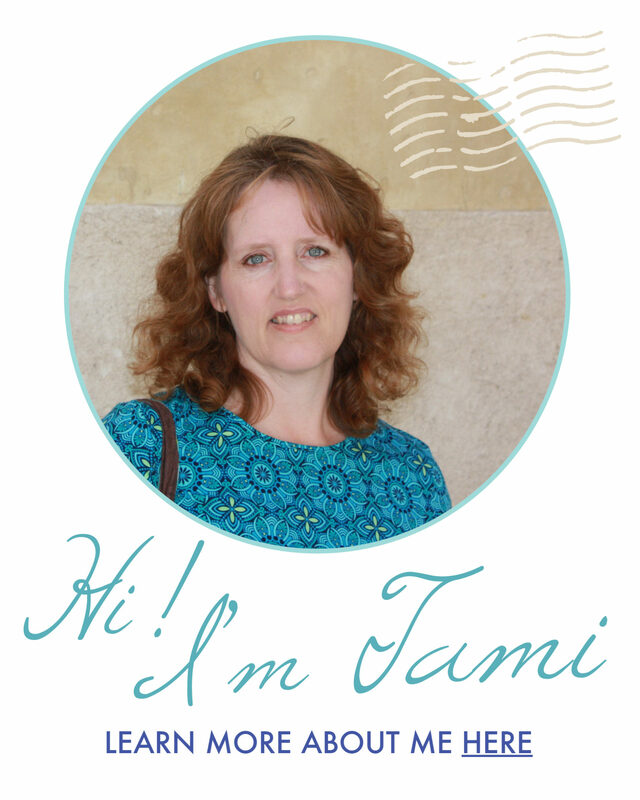 They were serving as missionaries, and I was a little jealous that they were experiencing the cultures, languages, and sights of European countries. My husband and I decided it was about time we made it to Europe as well. We chose Greece first because of its ancient history and its role in the birthplace of democracy. You will learn that I am obsessed with old things! I’ll tell you all about Athens in another post, but today I want you to experience the beauty of Santorini–just one of over 200 inhabited Greek islands in the Aegean Sea. How did I choose Santorini? Well…everything I read about Santorini raved about its amazing sunsets AND I had seen “The Sisterhood of the Traveling Pants”. Not that I recommend that movie, but the scenery in the Santorini scenes hooked me; I just had to be there. To stand in that incredibly breath-taking place and drink in its gorgeousness! Sappy, I know. I was enraptured by the water, the views across the caldera, the cobblestoned paths, the white-washed buildings with royal blue accents and magenta bougainvilleas. I wanted to breathe the air, feel the breeze on my face, and dive into the water! 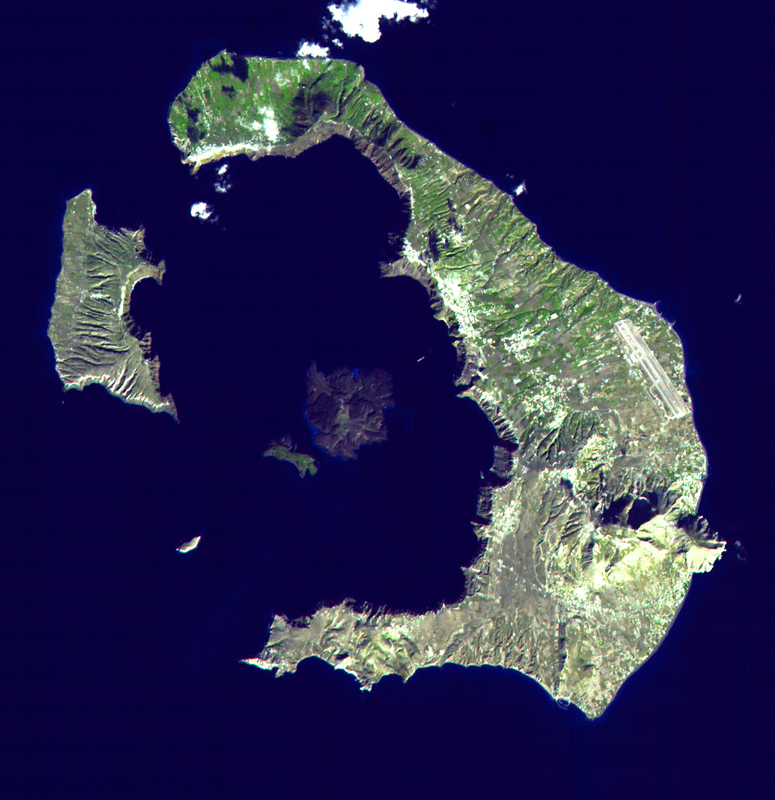 The island of Santorini was created by an ancient volcano erupting and collapsing in on itself, leaving only the outer “shell” of the original volcano and a small partially active cone surrounded by the Aegean. 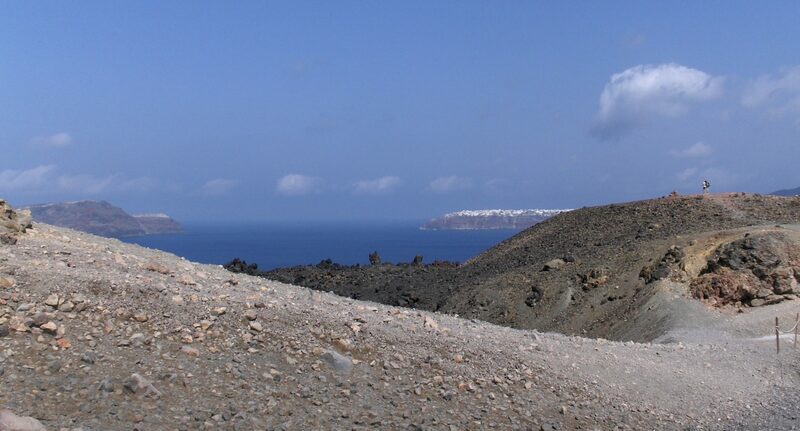 This is known as a caldera, and the views from the “shell” across the caldera are breathtaking. The volcanic eruption left thousands of holes in the sheer cliffs that face the caldera. Those holes, or caves, have been incorporated into many of the buildings on the caldera side of the island. Whitewashed villages sit atop the ridge and scrawl down the cliff face, anchored in these caves. From a distance, they appear almost as snow-capped hills. We decided we would fly from Athens to Santorini, rather than take a ferry. I imagine that the approach to Santorini by water is memorable. However, the ferry ride would have taken the greater portion of a day, and we were short on time. Our plane arrived at the Santorini airport at about 6:30 in the morning. We took a cab to our hotel, the Strogili Traditional Houses in the village of Oia (pronounced EE-a) at the northern tip of Santorini. Although we were arriving so early, the owner was very accommodating and gave us another room in which to rest until our room was ready. 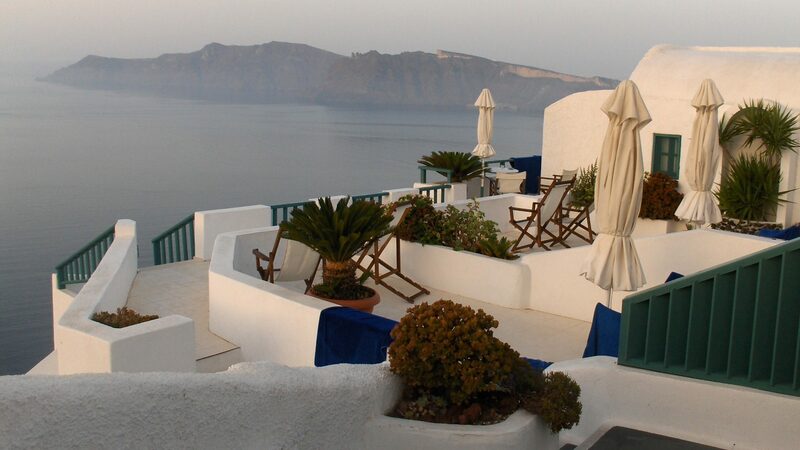 As we walked down the steps to the room, the view of the caldera opened up to us. It was absolutely silent (a silence you don’t know if you live in a city!). Literally the only sound we could hear was the breeze caressing the cliffs facing the sea. I was in awe. Absolute stillness. Peace and beauty–ahhh–nothing like it anywhere else! Oia is a small village off the beaten path (the cruise ships come into Fira). It is the best location for viewing spectacular sunsets and also boasts some popular restaurants, the port Ammoudi, and a few art galleries and boutique shops. There is no vehicle traffic in the village itself, only the outskirts, so it is pedestrian-friendly and easy to navigate, seeing as there’s really only one major paved path through the town. Getting to the port nearly three hundred feet below the town requires a walk down over 400 stairs built into the side of the cliff. 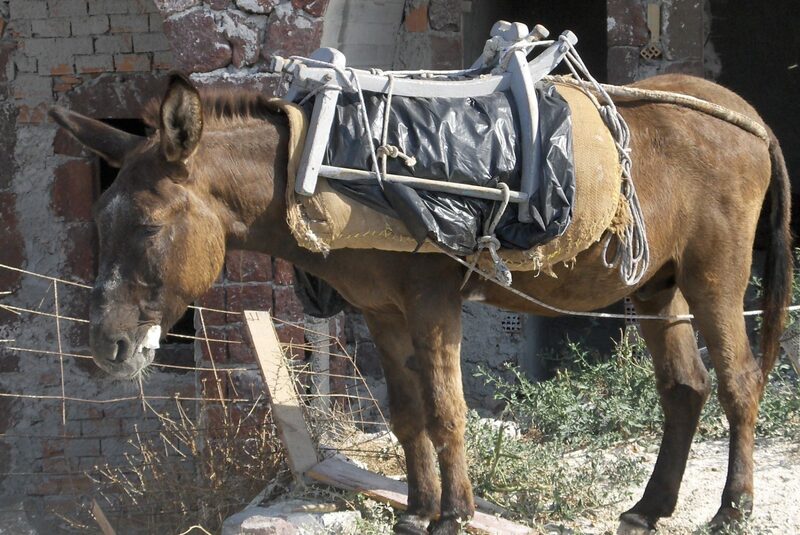 There are donkeys that you can ride back up the stairs, but we enjoyed the walk, allowing us to stop and enjoy the view as often as we liked. 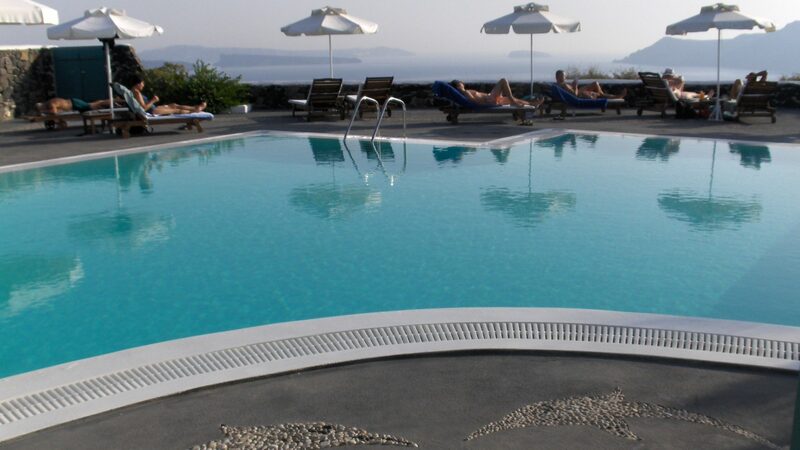 Our first day in Oia was spent enjoying the swimming pool that looked out over the caldera, strolling through the town, and taking in the highly acclaimed sun-setting experience on the cliff above the port. 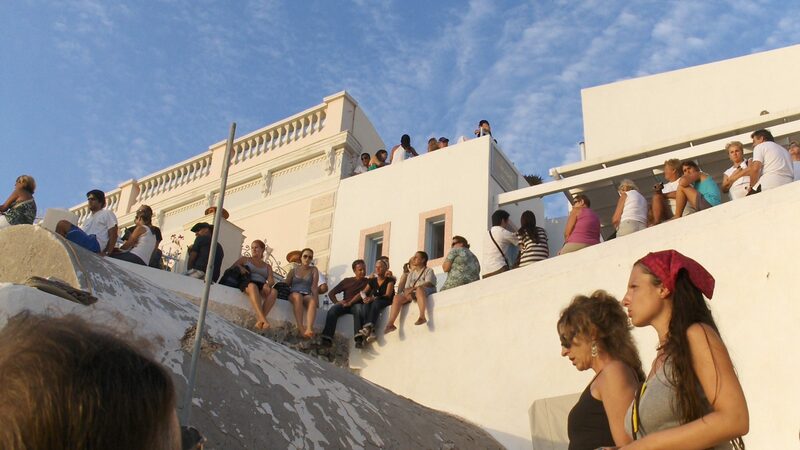 About an hour before sunset, everyone begins gathering, sitting on roofs, walls, and stairs to wait for the sun to set. You can hear people speaking in many different languages, laughing, singing, enjoying a great camaraderie. As the sun sank towards the horizon, the sky turned orange, and everyone cheered and clapped. I thoroughly enjoyed the connection with nature and with those who had come here to see it, too. 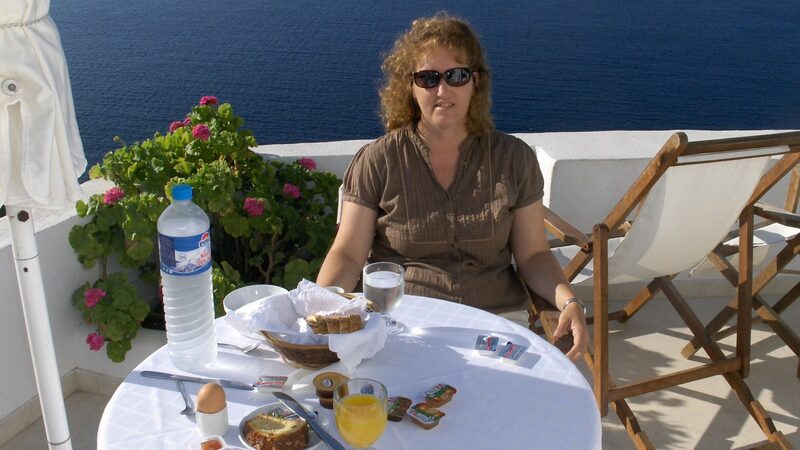 Our second day in Oia began with a tasty spread of homemade breads, greek yogurt with fruit, and juice, served on the patio outside our room overlooking the caldera. I couldn’t have asked for a more beautiful dining location. We had decided to spend our day on a boat tour to the volcano in the middle of the caldera. This time, we caught a shuttle down to the port of Ammoudi where we boarded a ship with about 50 other passengers. The water there is other-worldly. 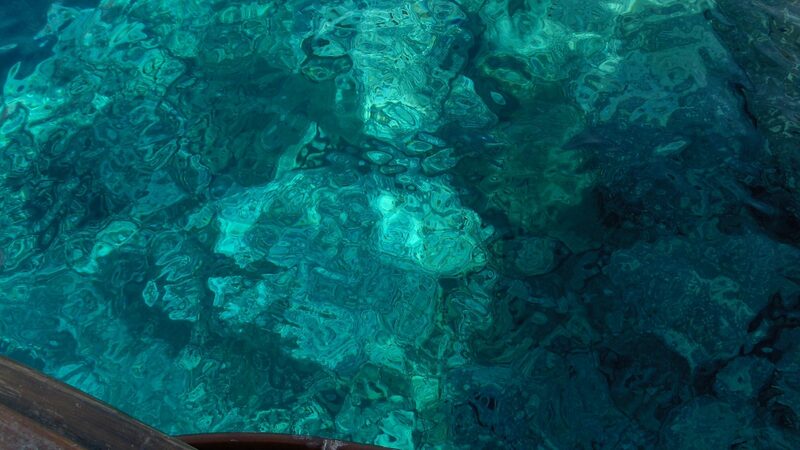 The colors and shimmering patterns I saw as I looked down are unlike any other waters I’ve seen. Once we reached the volcano, we disembarked and met a guide who led us up the slope of the volcano to a location where we could see whisps of steam escaping from the collapsed cone. Definitely the closest I’ve come to an active volcano, but it wasn’t hugely impressive. However, the views from the center of the caldera out to the surrounding crescent of islands was more than worth the trip. After our volcano hike, the captain of the boat took us to some warm spring-heated waters nearby. He invited us to jump off the boat and enjoy a swim for about 15 minutes. Just have to say here that there is nothing like swimming in the warm Aegean Sea underneath an all-blue sky! Definitely one of the most amazing experiences I’ve ever had. After boarding the boat again, we sailed to the island of Therasia. Here we had time to explore a little and get some lunch. We ate on a covered dock at a restaurant called Labros. Our seafood was cooked on an open grill and the smell made our mouths water! They also used a traditional Greek stone oven in which to roast stuffed tomatoes and other delectable-looking dishes. Finally, we returned to Ammoudi port. It had been an amazing day! We enjoyed exploring a little more of Oia, went to our hotel to freshen up, and then headed out to dinner at a recommended taverna called Santorini Mou. Many of Greece’s most authentic dishes are on the menu here. 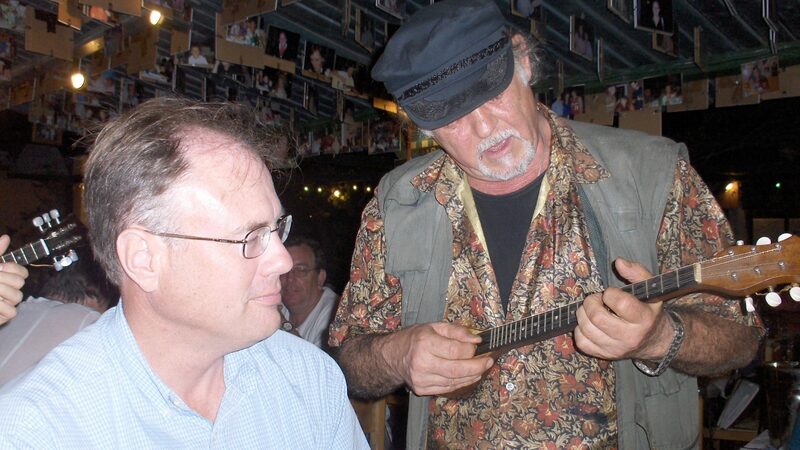 Mihalas, the owner, often walks through the restaurant playing his bouzouki and serenading the customers. He also takes a photo of everyone to hang from the rafters for all to see. (Now, they post the customer photos on their website). The next day, it was time to start working our way home. We checked out of Strogili and explored a little of Fira before catching our flight from the Santorini airport back to Athens. We were grateful we chose Oia over Fira. Fira was much more commercial and crowded, with more vehicle traffic and passengers from cruise ships emerging on the town all at once. Oia has won a place in my heart. 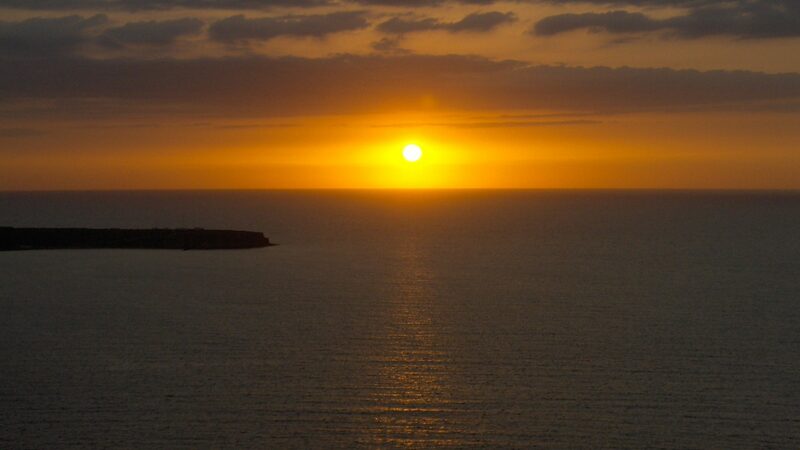 As much as I love to explore new sights, Oia is a place I would very much like to return to someday. Where’s your heaven on earth? Wow! Santorini just made it onto my list of places I’d like to visit!!! It sounds so peaceful and so beautiful! I’ll have to make sure I’m in tip-top shape before I go, though; not sure I could handle all those stairs in my current condition. 🙂 Thank you for sharing. Maybe that was Momma Mia. I was thinking of The Traveling Pants, possibly I’m confused. Haha! Mamma Mia was another great “Greek” scenery movie! I’ve always wanted to go. I’m not sure why I haven’t yet. It just looks amazing – the views, the sunset – the whitewashed buildings. It’s stunning. It really is beautiful. And so serene! I remember Santorini so well though it’s been decades since I visited. What a great trip you had and yes, I’d be jealous of the kids too! Santorini looks magical and it’s been on my list for a long time. My only concern is that it seems very expensive. Do you think it would be possible to visit it on a budget? Of course! We were on a pretty tight budget ourselves but we did splurge a little on a caldera-view hotel. There are hostels on Santorini for as low as 40 euros for a private room. I’ve been to Athens but didn’t make it to the Island. I regretted not making the trip and now even more so. What a beautiful place. Everytime I see this place in picture, I get goosebumps. Its the most picturesque town on the earth…at least for me. That’s how I felt, too, and that’s why I was so driven to go there in person! Santorini is one of my all-time favorite destinations! 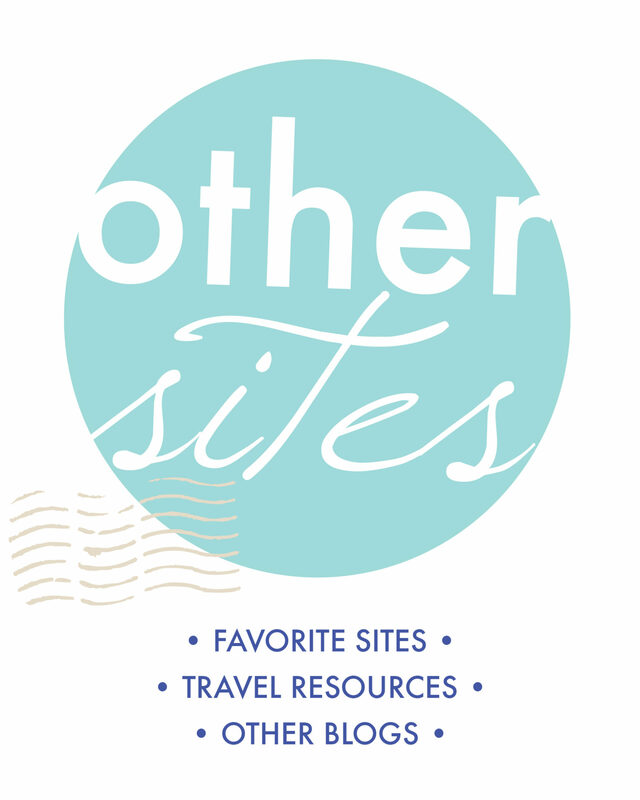 My husband and I stayed in Oia in 2013 and loved it! We rented a cave house overlooking the Caldera and it was magnificent. I can’t wait to go back. What a good trip for your first time overseas! Santorini is somewhere I’ve always wanted to go. It looks so beautiful. Your post reminded me a bit of my trip to Key West though. They also have great sunsets and everyone gathers and claps there also. I would love to see the water in Santorini. It looks so blue and the food looks amazing. I can’t wait to visit it someday. The food was great and very satisfying. And I don’t know what it is about the water, but it really is that incredible-looking! It sounds like you had a wonderful, relaxing trip.The seafood looks delicious!